Kick back, relax, it's almost summer. When the temperature rises, I like to cool off with a refreshing icy drink and this spritzer made with Aperol is one of my favorites. Aperol is an Italian apertif made from the essence of bitter oranges, rhubarb, herbs and spices. It's not really bitter, but has the tang of orange peel and the sweetness of oranges. Mixed with a sparkling wine like Prosecco, club soda, and a twist of orange or lime, it's quite irresistible and only mildly alcoholic. With only 11% alcohol, you can have more than one.Cheers, or should I say, chinchin! After what seems like an endless winter, spring has finally arrived in Ohio. 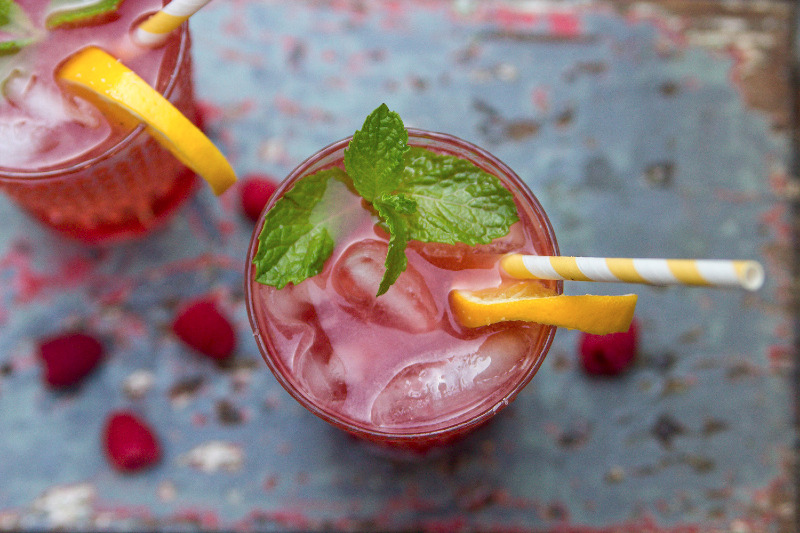 Along with the warmer temperatures come cool summer drinks, like this raspberry spritzer. Flavored with lemon, mint, and ginger, it’s perfect for entertaining.